William Benoit was the ninth of thirteen children of Mary Ann Dondanville and Lester Benoit. He was born on the family farm near Clare in Webster County, Iowa in 1879. He received his primary education in Jackson Township Schools. By 1890 his father's health had deteriorated to the point that the family was living in near poverty conditions. Bill left home at the age of 12 to fend for himself. His first job was with a railroad section gang laying and maintaining track near Knierim, Iowa. Among his other duties he was responsible for serving the crew their daily rations of beer. He once related that in the winter, they would serve the beer hot and this accelerated its impact. At times he worked as a farm hand. On February 23, 1909 Bill was married to Lydia Estelle Himes in Gilmore City, Iowa. Bill and Lydia farmed for a period on a property along Lizard Creek west of Clare. Their first two children were born there, Zola on February 20, 1911 and Irene on November 14, 1914. Sometime before 1920 they gave up farming and moved to Gilmore City. Their third daughter, Mildred Delores, was born in Gilmore City October 16, 1921. A son, William Kenneth, was born January 22, 1924. The family moved, in the mid 1930s, to Manson where Bill found work with the Calhoun County Road Department. 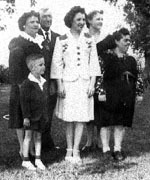 The Benoit family, being of French descent, was relatively unusual in Manson, a community where most of the early residents were of German and Scandinavian Descent. In the 1940s Bill was involved in the construction of grain elevators in Manson and near by communities. To supplement their income Lydia baked pies for the Corner Cupboard Restaurant. In 1945 Bill and Lydia moved into a small home on 7th Avenue in Manson, adjacent to the home of the Walter Charles Grays, whose daughter Helen would eventually marry their son William. Lydia died in Manson, July 14, 1959, just months after she and Bill had celebrated their golden wedding anniversary. In the mid 1970s Bill moved into a Manson nursing home. Bill lived to celebrate his 100th birthday. He died in the nursing home September 17, 1979.
born in Gilmore City, Iowa, February 20, 1911. Married Edward Ricklefs, January 18, 1988, daughter, Helen Irene, died at birth, son Kay, better known as Rick, born in 1937.
born in Gilmore City, October 16, 1921. Married Allen Ray Rosenquist in Chicago, November 2, 1942. Daughters Sharyn born in 1945 and Bonita Irene in 1946.